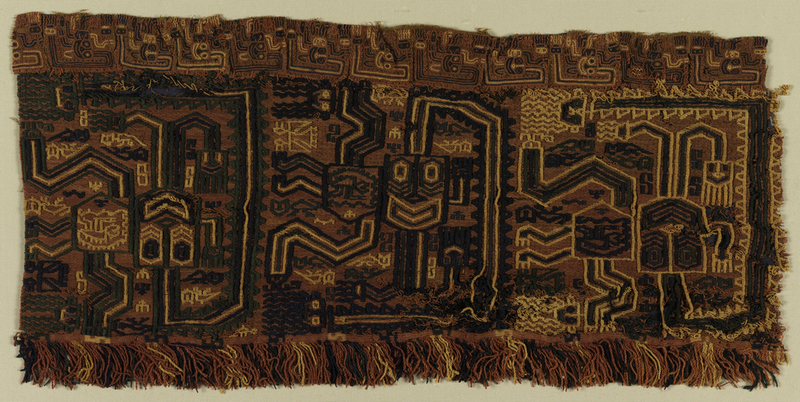 This border fragment, formerly part of a large mantle, is one of a group of textiles found in a necropolis on the Paracas peninsula in southern Peru. Over four hundred such burials were found in the 1920s by Peruvian archaeologist Julio C. Tello, including mummy bundles wrapped in layer upon layer of beautifully embroidered textiles and garments, preserved by the arid desert climate. The meticulous stitching, complex iconographic program, and incredible preservation of sets of garments all embroidered in a similar style has made the Paracas embroideries among the most prized textiles known. Here, the embroiderer utilized her needle and thread to create an entire surface covered with complex symbolic and religious designs. The main figure depicted is the large-eyed, grinning being whose orientation has been described as either standing with his head sideways and backwards, in an ecstatic pose, or else ‘floating,’ flying or falling. Interpreted as a shaman or deity figure, streamers exude from his head and body, and a smaller version of the figure is represented in his belly. Every space is filled with energy and movement, with small animal figures filling the interstices around the rayed body.